Boat type ----------------------- Sailboats - all - Sailing yachts - Sailing catamarans - Traditional sailers Powerboats - all - Motor yachts - Mega yachts (motor) Charter country ----------------------- British Virgin Islands France Great Britain Portugal Spain Charter area ----------------------- Caribbean Sea - Caribbean Islands - Caribbean Sea - Virgin Islands Mediterranean Sea - Balearic Islands - Costa Blanca - Costa Brava - Costa Cálida - Costa Dorada - Formentera - French Riviera - Gulf of Roses - Gulf of Valencia - Ibiza - Ligurian Sea - Majorca - Mediterranean Sea - Minorca North Atlantic Ocean - Azores - Canary Islands - Fuerteventura - Galician Fiords - Gran Canaria - Lanzarote - North-Atlantic - Rías Baixas - Tenerife Port ----------------------- Please choose a country! 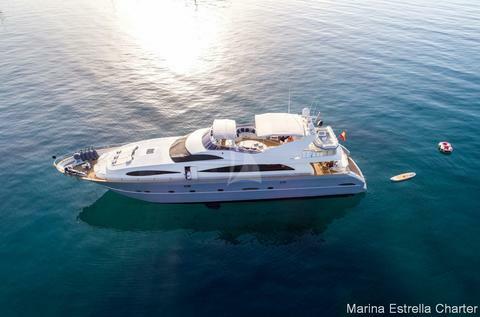 We are MARINA ESTRELLA, a company with more than 30 years experience in selling and chartering boats. We are distributors of Azimut Yachts, Hanse Yachts, Moody, Sasga (Minorchino) in spain. For charter, we offer you the greatest boats in Spain and Mediterranean countries. You can choose among sailboats, motorboats and of course catamarans of all sizes and categories. We are specialist in luxury crewed boats... both motor and sailing super yachts. Just contact us and we will find the perfect boat for you to charter. COME AND ENJOY THE SEA WITH US! Day charter or complete weeks. Obligatory skipper included in the price. Sleeping capacity up to 6 in her three double cabins. 2 complete heads. Crew cabin. HUGE FLYBRIDGE.